I have often said that the best part of my job is talking to people who’s work I have long admired about the work I’ve long admired. 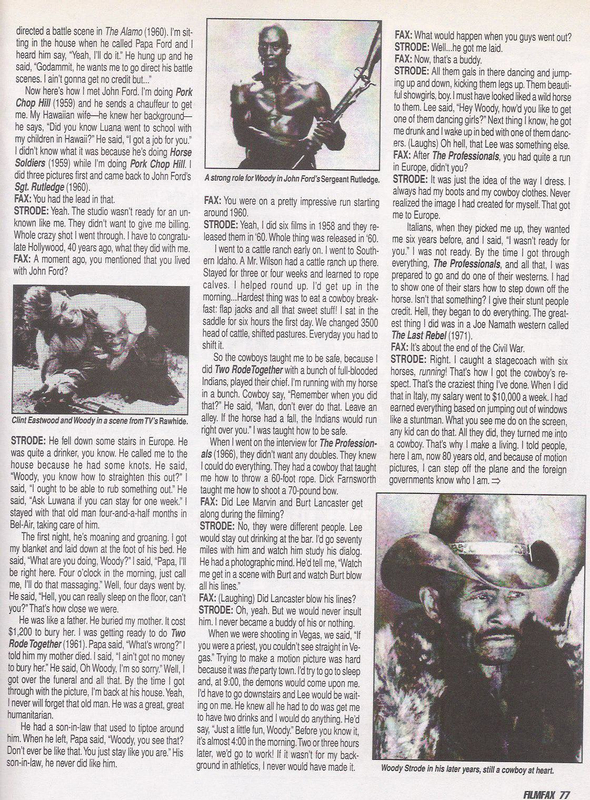 One of the best examples of this was the interview I did with Woody Strode for Lee Marvin Point Blank way back in 1994. He welcomed me into his Glendora home, spending the day remembering his friendship with Lee Marvin and telling wonderful anecdotes about his illustrious career. I knew he wasn’t feeling well that day as he was dying of cancer at the time. In fact he passed away a few months after our talk. 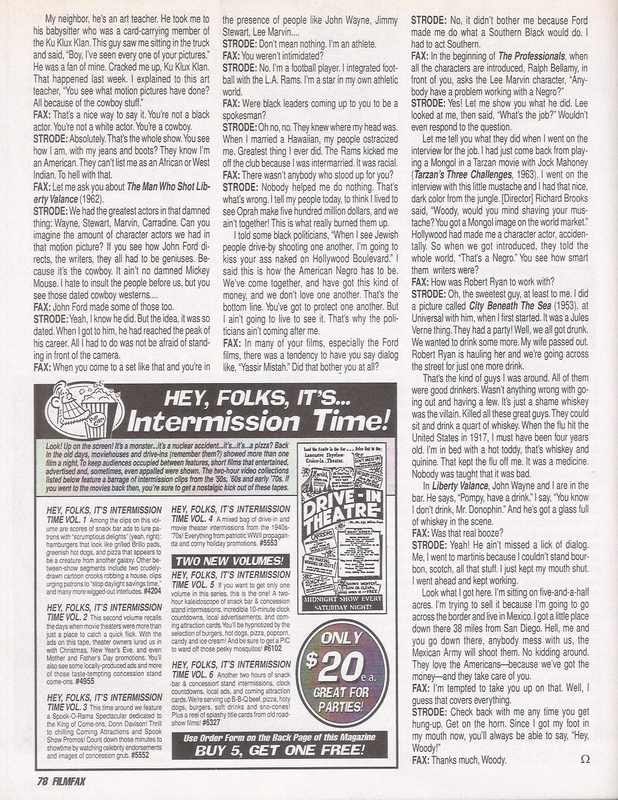 He never let on about his obvious discomfort and was so informative, FilmFax agreed to publish my talk with him in their Feb. 1999 issue. It is below for your perusal. As a side note, it doesn’t often happen that I can do a good thing for someone by pure happenstance, but I did for Woody. Shortly after our talk, I interviewed director Budd Boetticher. He asked me who I had spoken to so far and when I mentiond Woody, he lit up like a Roman candle, asking me to put him in touch with his old friend. With Woody’s permission I did just that and the two old friends were able to re-connect shortly before they both passed away. This entry was posted in Blog and tagged Burt Lancaster, Cecil B. DeMille, Dwayne Epstein, Filmfax, football, Jimmy Stewart, John Ford, John Wayne, Kenny Washington, Kirk Douglas, Lee Marvin, Lee Marvin Point Blank, Richard Brooks, Robert Ryan, Sgt. Rutledge, southern California, Spartacus, Stanley Kubrick, The Man Who Shot Liberty Valance, The Professionals, The Ten Commandments, Woody Strode, wrestling by Dwayne Epstein. Bookmark the permalink. Fabulous, Dwayne! So happy you shared this! Love it! Thanks Christy. As Johnny Carson used to say, more to come! That is one beautiful man and a great interview. Loved it! 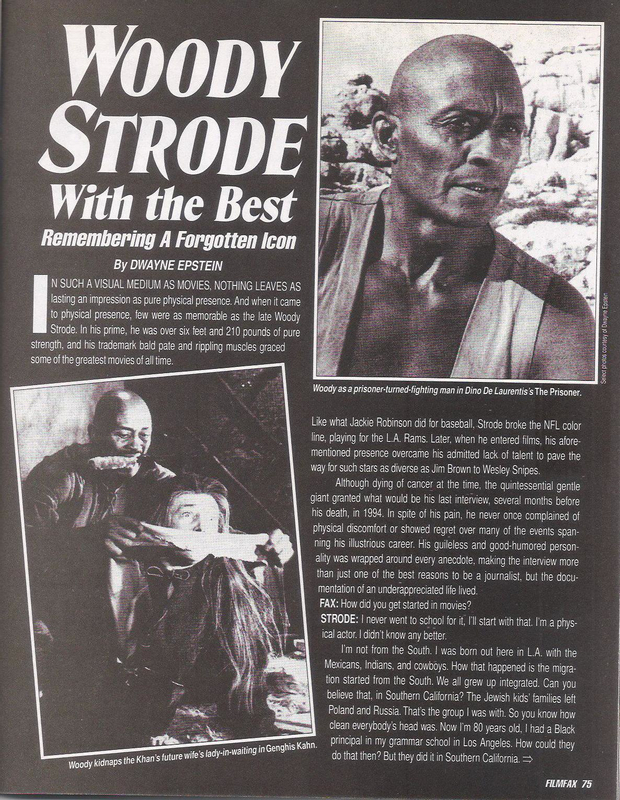 Always have been a big fan of Woody Strode. I worked with his son way back in the late 90s when I was a DGA Trainee and he was a 2nd Assistant Director, just before he retired to Hawaii. Thanks for reposting! My pleasure, Carrie and thanks for sharing your experience with Woody’s son. What a great interview. Woody comes across as a warm hearted and decent person. 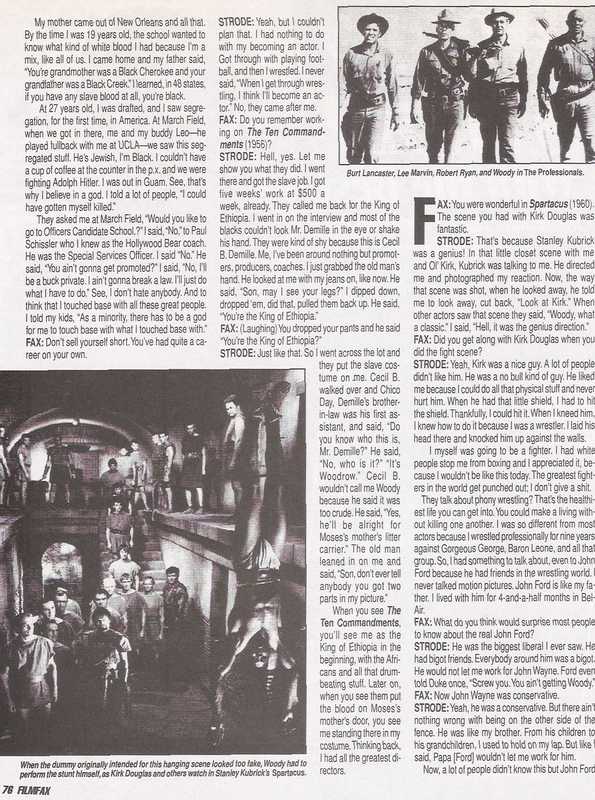 Has kind words to say about Lee Marvin and the other film legends he worked with. Thank you, Gareth. That’s very much appreciated. Have you read Lee Marvin: Point Blank, yet? There’s even more great stories from Woody in there: from Liberty Valance to The Professionals, and more! You should check it out if you haven’t, yet.